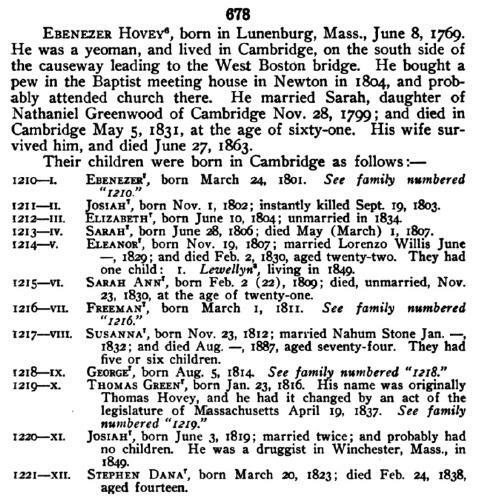 Vital Records of Templeton Massachusetts to the end of the year 1849, Worcester, MA: Franklin P. Rice, (1907) , p. 120. 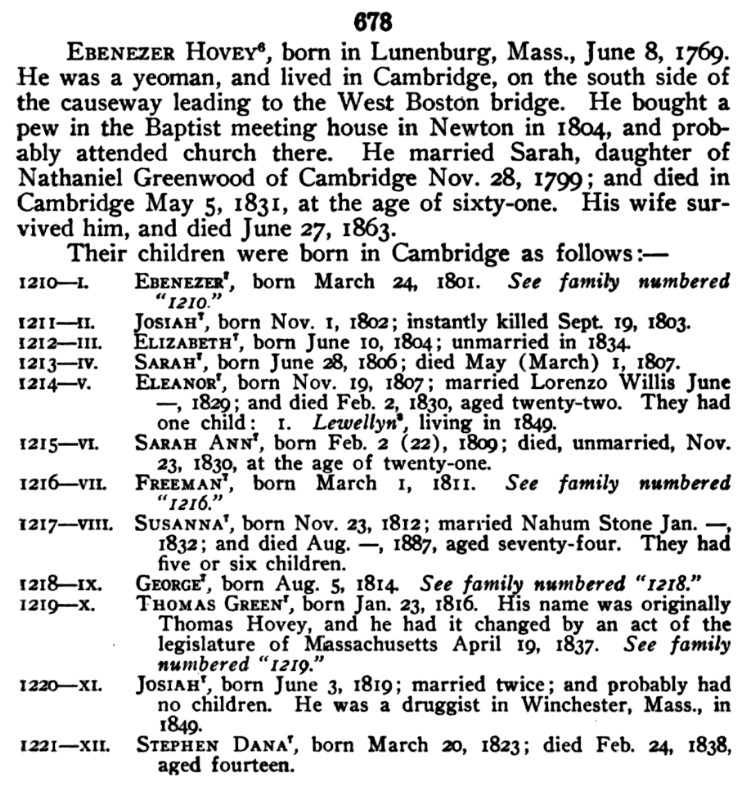 "Massachusetts Deaths, 1841-1915," database with images, FamilySearch (https://familysearch.org/pal:/MM9.3.1/TH-267-11392-41329-15?cc=1463156 : 20 May 2014), 2217701 (004282862) > image 1381 of 2232; State Archives, Boston. 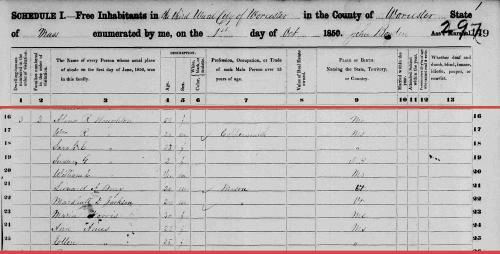 Vital Records of Scituate, Massachusetts to the year 1850, Boston, Mass. 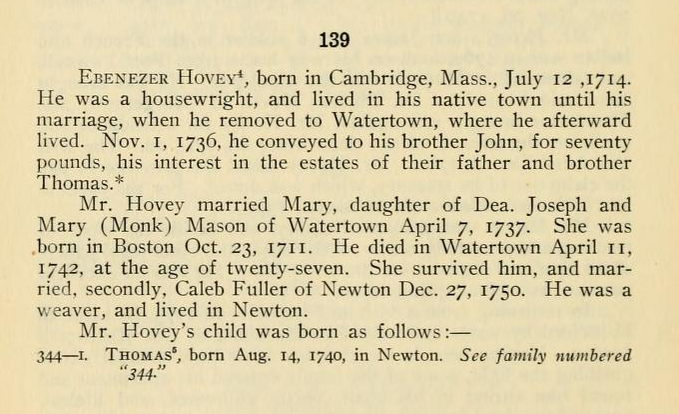 : The New England Historic Genealogical Society, (1909) , vol. 2, p. 128. 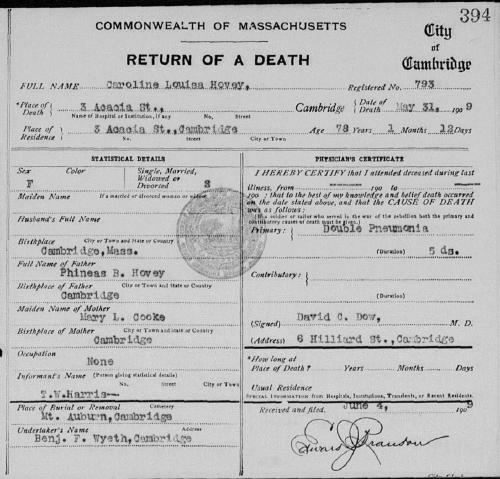 "Massachusetts Deaths and Burials, 1795-1910," database, FamilySearch (https://familysearch.org/ark:/61903/1:1:FHPT-KMQ : accessed 26 October 2015), Joseph House, 20 Sep 1732; citing Scituate, Plymouth, Massachusetts, reference ; FHL microfilm 423,512. 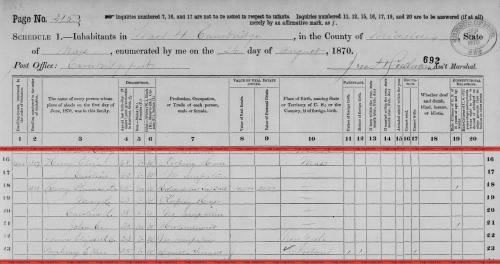 Thomas W. Baldwin, Vital Records of Cambridge, Massachusetts, to the year 1850, Boston: Wright & Potter Print. Co., (1914) , Vol. 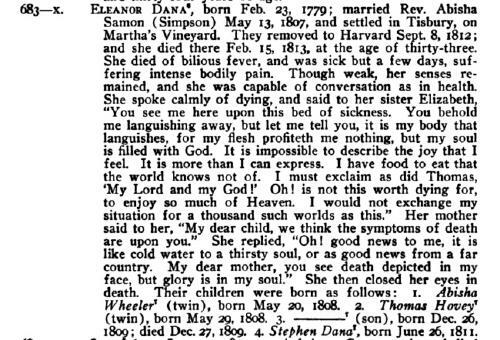 2, p. 207. 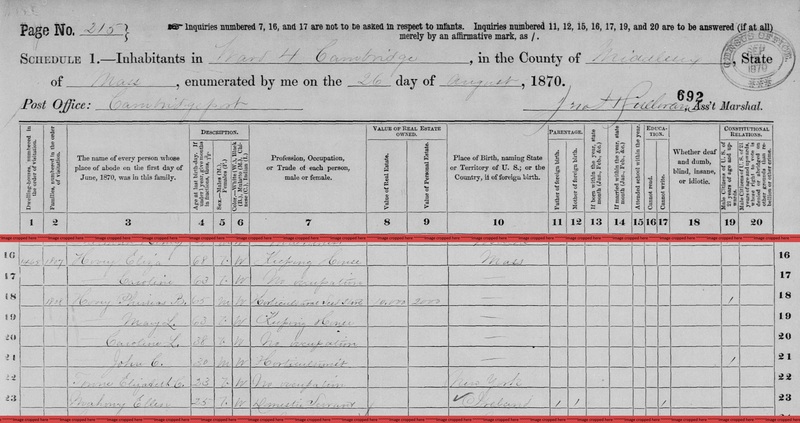 Thomas W. Baldwin, Vital Records of Cambridge, Massachusetts, to the year 1850, Boston: Wright & Potter Print. Co., (1914) , Vol. 1, p. 124. 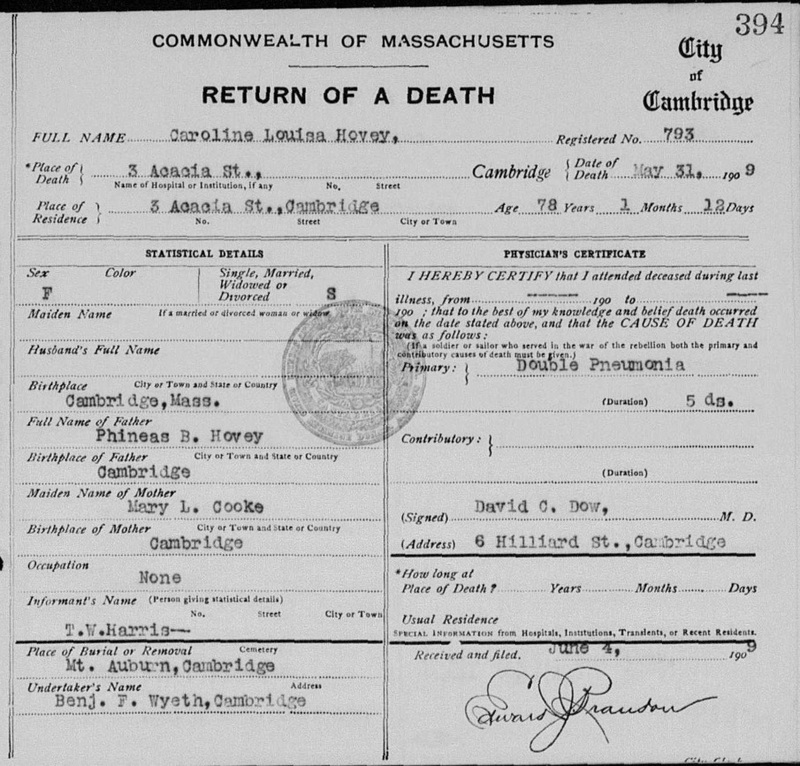 "Massachusetts Deaths, 1841-1915," database with images, FamilySearch (https://familysearch.org/ark:/61903/1:1:NW17-LTP : 10 December 2014), Caroline Louisa Hovey, 31 May 1909; citing Cambridge,,Massachusetts, 394, State Archives, Boston; FHL microfilm 2,257,991. 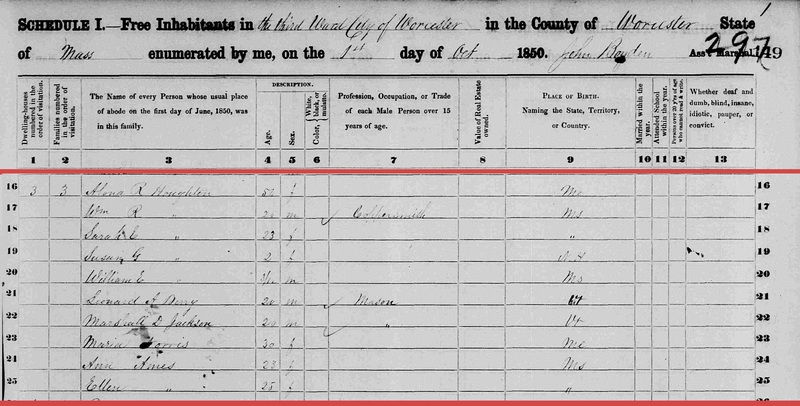 "Massachusetts Marriages, 1695-1910," database, FamilySearch (https://familysearch.org/ark:/61903/1:1:FCWK-FQ1 : 4 December 2014), Charles M. Hovey and Ann Maria Chaponil, 25 Dec 1835; citing reference ; FHL microfilm 496,864. "Massachusetts Marriages, 1695-1910," database, FamilySearch (https://familysearch.org/ark:/61903/1:1:FCWV-2HM : 4 December 2014), Lorenzo Dow Willis and Elenor Hovey, 11 Jun 1829; citing reference ; FHL microfilm 496,864.